Maseo is ten years old. She lives with four siblings in Nhembia, Mozambique; the eldest is her sixteen-year-old brother. Maseo watched her parents die: her father in 2005 and her mother in 2006, after suffering long illnesses. 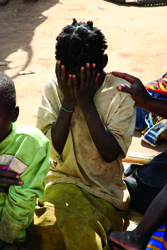 This was too much for the young girl to handle and, shortly after their deaths, Maseo ran away from school and home to a neighboring town, selling sugar in the market. Volunteers from Rubatano Home-Based Care, Hands at Work’s partner in Mozambique, had been helping the young children care for their sick parents. When the parents died, no relatives were available to live with the children, so they lived alone, and Rubatano’s home-based care volunteers watched over them. When Maseo ran away, the home-based care volunteers went to Beira to bring her home. The young girl, unable to cope with life without her parents, ran away a second time. Again the volunteers went to find her and this time she stayed in Nhembia. Today Maseo is in grade 4 and in the top of her class. The once timid and broken girl who would not even smile now talks and laughs. Though exposed to many hardships in her young life, Maseo’s vulnerability has not crushed her dreams and she says she would someday like to be a teacher or a nurse so she can help people. Maseo is coping with the help of the home-based care volunteers who, in addition to caring for and counseling Maseo and her siblings, provide the children with food and educational assistance, like looking over their homework.